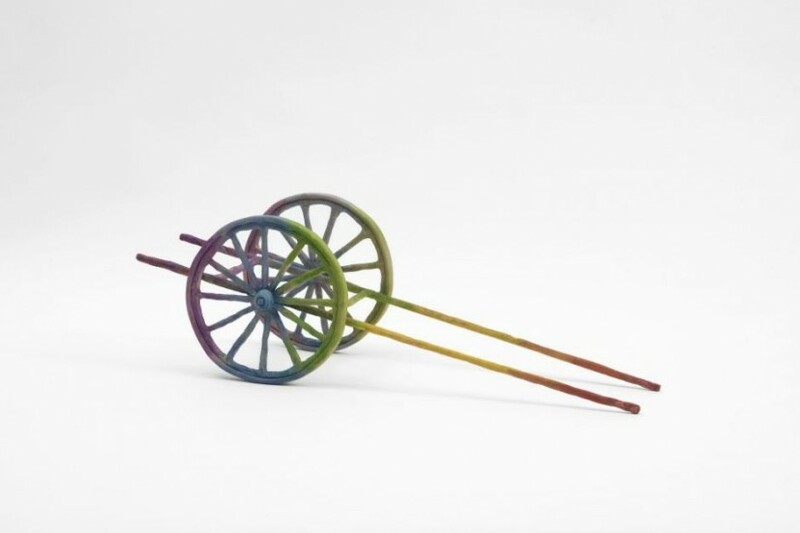 Kate MacGarry loves a bit of an art/craft crossover: a number of her artists use ceramics and textiles as part of their vocabulary (witness the tapestries of Goshka Macuga, Renee So’s wonderful knitted works and Tiago Carneiro Da Cunha’s ceramics), and Francis Upritchard’s latest show reinforces the profile of one of London’s most distinctive and best loved contemporary galleries. Having represented New Zealand at the Venice Biennale in 2009, and with recent exhibitions in Kagawa, Japan, New York and Dublin, Upritchard’s show in London is self-confident and expansive. The figurative sculptures, in signature rainbow-coloured modelling material, are now clothed rather than vulnerably naked as before. Their various costumes – drooping floor-length robes and extravagant coiffures – enhance their status as archetypal characters from some dread medieval mummers play or esoteric new age performance. And they are no longer the miniature figures that pointed at some talismanic function: standing on their steel plinths, they look us in the eye now, like more interesting versions of the nonetheless equally creepy living statues you see around town. 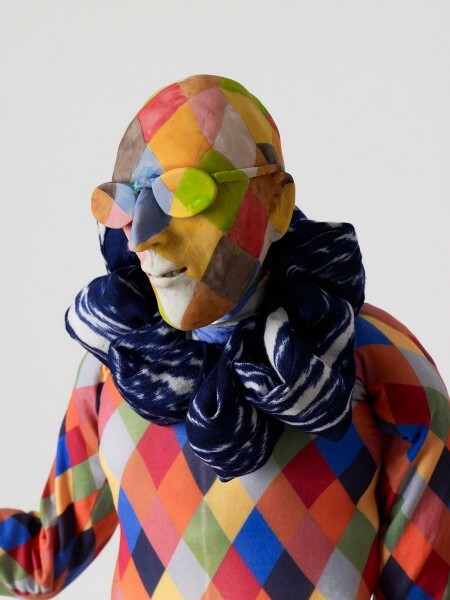 The anatomically correct harlequin, whose motley extends over his face and Aviator shades, is the most charismatic of the group of figures that confront you, gesturing, as you enter the gallery. Where before the often foetally hunched figures were characters dislocated from narrative, these new sculptures seem to have moved closer to a more developed identity, while never actually revealing their purpose. And there is a political point at stake here that relates to the ineffectual utopianism of the 1960s/70s hippy movement, and the dark consequences of that failure. 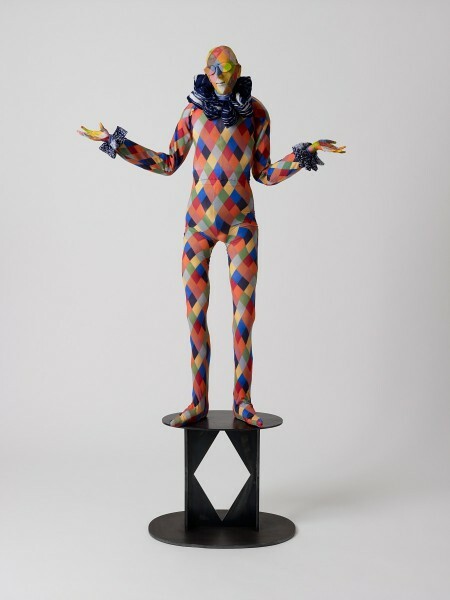 Another aspect of Upritchard’s sculpture, as pointed out by Kate herself, is that she is unusual as a female artist creating exclusively male gendered figures. I don’t know that this reflects any particular agenda, but it is worth noting as it so nicely flips the standard male/female, artist/model relationship. Anthropomorphising pots straight out of a Grimmer form of fairy tale, or a 1970s Czech animation squat on shelves – a development from the Egyptian inspired canopic jars that were part of a body of work that won Upritchard the Becks Futures prize in 2003 – and complete the installation: if this were a play they would be the Greek chorus. The pots have the same pointy, elfin noses and thin lips familiar from the standing figures and are quite definitely genetically related. Judging by the attendance of various well known and serious private collectors and public gallery directors at the opening last night, the buzz around this artist is only increasing. Take advantage of the sunshine after seeing the show and stroll down the very chic Calvert Avenue for a delicious something at the gorgeous Leila’s café, and a quick nip in to Ally Capellino’s bag boutique two doors along if you still have pennies in your purse.